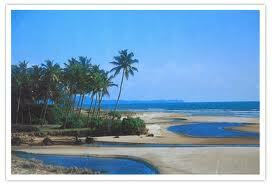 How to Reach: Varca beach can be reached easily in south Goa by hiring a taxi or an auto. Any local transport can bring you to Varca beach. The Varca beach in Goa is not as commercialized and crowded as other major beaches of Goa. Instead the quiet beach attracts visitors without fail since it is less crowded and cleaner than other big beaches. Come to Varca beach if you want a holiday in India that is absolutely relaxing and rejuvenating. The Varca beach has soft sandy shores dotted with coconut trees and the turquoise blue sea right in front. Nature is virtually unspoilt over here and you can really indulge yourself in some soul searching and moments of peace. The Varca beach is ideal for just lazing around and exploring local shacks. The idea is to be free of any hassles of exploring and sight seeing and just do what your mind feels like. You can also hire a boat and go out boating in the sea with an expert guide. You can also spot dolphins if you are lucky enough. There are many local shacks and restaurants near the beach that provide exceptional Goan food. You have to try the sea food or your trip to Goa is incomplete. Finding a place to eat should be your last thought. The Varca beach offers decent accommodation. You can find resorts, deluxe hotels as well as budget hotels near the beach that offer good services and also suit different budgets. You can pamper yourself silly at the resorts with an Ayurvedic massage or stay at the budget hotels that provide good quality service and true Goan lifestyle even though they are not as extravagant as resorts and deluxe hotels. When you visit Varca beach, you can be sure to the time of your life in this place.